The biggest clue when looking for a good cattery is the place where the kitten comes from. To find a kitten that is most likely to be well-adjusted and healthy, it is important to find a cattery that keeps their cats clean and socially active. After all, a happy mom cat will produce happy kittens. 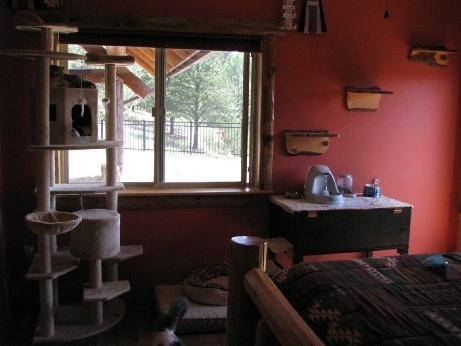 Tiny Lions Napoleons is a small pet-friendly, cage-less cattery located in Divide, CO, in the beautiful Rocky Mountains. Our cats are part of our family and allowed to run around the house. However, due to also having dogs in the house, it is necessary to have a special place for the cats to retreat to for quiet time. We invite you on a photo tour of our home to see how our cats live. Anyone interested in one of our kittens is always welcome to tour our home in person. This is the cats’ main level sanctuary, where they go when we leave the house to keep them safe from harassment from the dogs, should that happen behind our backs. Our cats took over our son’s room when he went off to college. The idea of taking out the bed did not go over well with the cats. They use it for lounging and to play on. I find that it’s an essential piece of furniture for them. Cat toys and condos can be found throughout the house. These condos are quick safe havens for when the cats want peace from the dogs or other cats. For any cat living with dogs, it is always smart to have a place where it can climb to safety, no matter how friendly the dogs are. When we got our Minuets, I had a friend make these beautiful shelves so they could join me while I do office work. My dog is always faithfully by my side, so it was necessary to add the shelves for a safety measure–just in case. Josie chilling in the bathroom connected to the office, one of her favorite places. Another favorite is in a cubby hole above the bathtub (to the right, not visible), where she can seclude herself out of sight. This is a photo taken by our wildlife camera outside our garage one night. 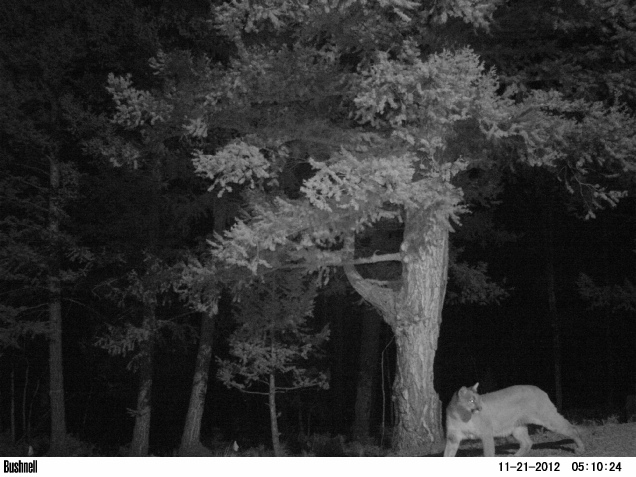 This mountain lion is only one of a few that live in the area. I’ve run across a pair of them feeding on a deer during broad daylight behind the house. We love our wildlife out here but our little lions (our Minuets) stay inside, for obvious reasons. 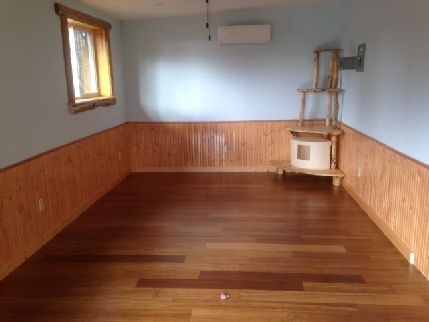 This is the nursery we added to the house, where new litters will be born and kept in peace and quiet from the rest of the animals in the house. They will arguably have the best views. Currently, the nursery has in-floor heating and a marvelous bed where I can sleep in anticipation of delivery and afterwards. Note: If you are calling and you do not receive an answer, please leave a message. Due to the inordinate number of unsolicited callers, we screen our calls from unknown numbers. Leave a time when it’s best to call you back. We will return your phone call. 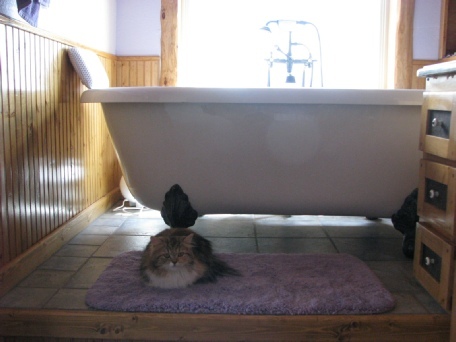 Living in the Rocky Mountains, our cats have breathtaking views from every room of the house. There are no other buildings to block these marvelous vistas.